Sorry for the lack of updates because was busy battling with two issues which is the web server config and my laptop battery problem. After upgrading from Windows Vista to Windows 7 on my Acer laptop, one of the annoying problem which I have tolerated for the longest time is the battery. The laptop is about 3 years old and is still using the original battery which is worn out that doesn’t last very long. I noticed that there is a battery icon with a red X on the notification area. Clicking on it tells me to “Consider replacing your battery“. “There is a problem with your battery, so your computer might shut down suddenly.” I never cared much about that because most if not all the time my laptop is connected to the direct current (DC) power supply. One day I brought the laptop out and suddenly it just shuts off by itself even though I am very sure I saw that there is still around over 60% of power left on the battery. 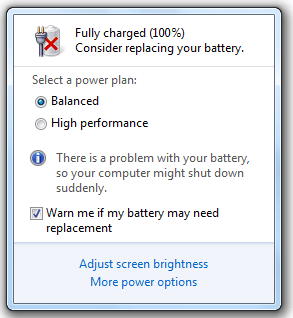 I did a lot of research and found out that Windows 7 is able to effectively tell if a battery needs to be replaced. I wanted to order a new battery directly from Acer but the service center is 45 minutes drive from my place. I didn’t want to waste time so through online I bought a new OEM battery from a third party company. When the new battery arrived, to my disappointment that the battery fail to charge. Windows 7 reports “No battery is detected” and the battery LED on the laptop is blinking orange. I thought I bought the correct battery because it is the same model as the original battery printed Model P/N: BTP-AQJ1. I had to send the new OEM battery back to get a replacement thinking that it is probably faulty. Received a new battery for the second time but still experiencing the same problem. The seller then told me that it is a common problem on Acer and this is caused by newer version of BIOS. I downgraded to every available older version of BIOS but the battery was still unable to charge. I reasoned with the seller that this problem cannot be caused by the BIOS because the battery LED starts blinking orange whenever the DC is connected WITHOUT even powering on the laptop. The seller agreed and very much later sent me a new batch of the battery but still no go. I gave up, called Acer and ordered a new battery. When the battery arrived, I picked it up from the service center and was shocked to see that the battery ordered from Acer cannot charge too! There is just no logic why my original battery can still charge but 4 new batteries including the one that ordered from Acer can’t. So I brought my laptop together with the original and new Acer battery to the service center and finally after testing a couple of different batteries, they found out that it was an incompatible battery problem. There is a sticker with bar code and random letters and numbers which is more important that the Model Part Number BTP-AQJ1. Take note of the bold part and that is what you should be searching for when you want to buy a new Acer laptop battery. If you wonder why Acer sent me a different battery model and not the same one as the original, that is because the original battery is obsolete and no longer in production. By the way, if you think that Windows 7 does a bad job in providing information on the battery, you should definitely try something like BatteryBar. I’ve experience this once last time, my brother’s laptop. RAYMOND!! Please help!! My school uses some sort of Mcafee search filter, and it blocked your blog because it “had a bad history” (probably with past ad sponsors blacklisting your site due to stupid reasons). Please address this issue to Mcafee please! I would like to read your blog at school too!! I didnt understand how what co-relation you tried to show between the original battery and the battery that worked. Thanks for the article, but how does this help other Acer users? I’m sure not every Acer laptop uses the exact same battery model, so looking for “BT00603044” probably won’t help anyone else. And if what Tangomouse says is true, those 10 characters are the serial number anyway, and by definition serial numbers are unique. There wouldn’t be any other battery with that number. Raymond its the Windows 7 who killed your laptop battery. I have experienced the same issue on after installing windows 7. “Consider replacing your battery“. “There is a problem with your battery, so your computer might shut down suddenly” this message started to appear on some models of Acer, Hp, Lg, Asus,Dell, Toshiba… laptops which had almost 1:30 to 2:30 hour backup on battery before installing windows 7 .if u continue to work in windows 7 after seeing this message think about it twice because it will permenently damages the battery life Reducing battery backup to 0 to 10 minutes . I had to replace the battery of brand new Lg lap which had windows vista OEM on it in wich i made a dual boot of windows vista and windows 7 ,after installing win7 i noticed the a message under the battery icon “Consider replacing your battery” at first i thought its due to low battery so iplugged in ac adaptor then another message showed up “Plugged in ,But not charging” i was confused so i rebooted the lap and gave a try in windows vista. In vista there was no message abt battery it was charging and discharging properly.So i continued in windows 7 installing applications and games after 3-4 hours i logged in to vista and saw a red cross mark blinking on battery icon “Plugged in ,But not charging” after a week the battery was completly zerooooo and needed to replace and never used win7 on it. hi raymond!! i first thought by looking at the post that u hav the same prob that my frnd has…nd i was glad that i wuld b able to help him…but i tnk ask u abt that!!! my frnd was running win7 on his dell vostro……but then he has to downgrade to winxp for compatibility issue of a software that he has to use for work. after he finished his work….he again installed win7 but just after installing win7 he got the same msg u got “consider replacing ur battery”…..he re-installed win7 but of no use….he has to plug-in all the time to use the laptop!!!! Interestingly, my another co-worker came across the same prob when he downgraded from vista to xp…..this time his laptop didn’t even wait for the up-gradation again!!!! And avoid those Chinese knock-offs.Even if they do include the driver for the Bios update,chances are it will not delete the “whitelist” placed there by the manufacturer.You need code written to do so,and even then success is limited at best.Manufactures see revenue lost in after market sales of accessories and replacement parts,and are taking the steps to stop just that.It’s getting harder all the time to get a $40 battery that will work in a newer build.I learned that from my workbench. Good information for me. I’m tucking it away for the day my Acer laptop needs a new battery. do you have any information about dell inspiron batteries too.